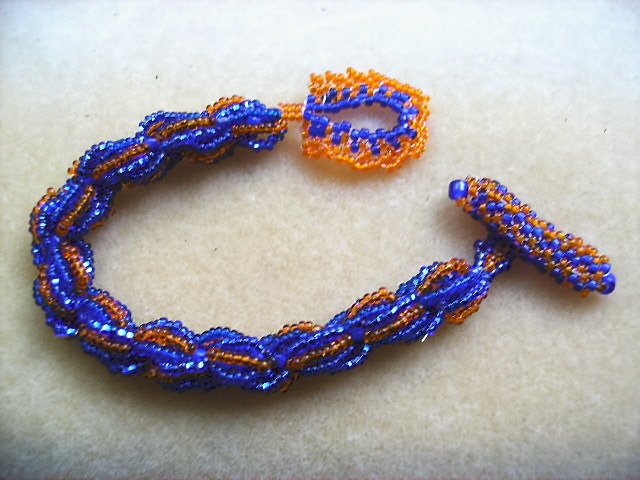 This entry was posted on July 14, 2008 at 10:6:40p07 and is filed under beaded jewelry, Gator football, seed beads, Uncategorized. You can follow any responses to this entry through the RSS 2.0 feed. You can leave a response, or trackback from your own site. That is so cool, Subeeds! It does look like it would whip up quick too! I have so many unfinished projects, but I’ll add this one to my list of things to try. Do you mind my asking what thread you used for it? I used Nymo B for it. I like that size because it just seems to work well with all the bead sizes I have and let’s me pass through them as few or as many times as I need to. Last bead order from FMG, I got the giant spool with something like over 1200 yds. on it. Thanks Subeeds. I only have Superlon right now. Have you ever used it? I never know what is the best type to use. I just awarded you the Arte y Pico award! Pop over to my blog, Behind the Scenes at Jewelry Tales (http://cindydaniel.blogspot.com/2008/08/arte-y-pico-award.html) to see what I’ve written about you!